View Campaspe River Basin in a larger map (opens new window). The river is 160 km in length and can be divided into three main sections, each with a different channel structure. The upper section above Lake Eppalock rises near Woodend and flows for 50 km to Lake Eppalock. This section of the river flows in volcanic country with extensive rock substrate and has good pools closer to Lake Eppalock. There is a very small reservoir (Campaspe Reservoir) located upstream of Lake Eppalock to supply water to Woodend. It has little effect on flow in the upper reaches of the river. The section from Lake Eppalock down to Campaspe Weir at Elmore has good pool/riffle definition with some areas of deep water and predominantly rubble and gravel substrate. The lowest section from Campaspe Weir down to the Murray River has a uniform channel shape, sand substrate, abundant snags and shallow water. Flow in the river downstream of Lake Eppalock, to the Murray River at Echuca, is totally controlled by weirs, reservoirs and irrigation releases. Flow at different localities can vary from 0-10 ML/d during the non-irrigation period, (15 May-15 August), to 500-2,200 ML/d during the irrigation period. Water sent downstream from Lake Eppalock can be diverted at Campaspe Weir (45 km downstream from Lake Eppalock). Remaining water then travels a further 20 km to Rochester Weir, from where it can be diverted by siphon pumps into the Waranga Western Channel. The remaining water then flows 45 km to the Murray River. This section of the river has received very low flows in recent years. Priority work under the River Health Program is control of erosion, eradication of weeds, revegetation and fencing off the river bank to stock. Work is continuing on three reaches. An environmental flow has also been allocated to two reaches of the river as part of the Bulk Water Entitlement process. A flow of 10 ML/d or inflow whichever is least has been committed downstream of Eppalock Lake. A flow of 35 ML/d or natural flow whichever is least during December-June, has been committed downstream of the Siphon Pumps at Rochester Weir. These flows have not been provided during the current drought period. They are to be reviewed in 2009. An assessment of the ecological condition and health of the Campaspe River valley at a number of sites has been carried out (Sustainable Rivers Audit) as part of the Murray-Darling Basin Native Fish Strategy This will provide information of the effects of any environmental flows, aquatic habitat improvement works and also the effects of sustained droughts on instream biota. The river is small and shallow and flows through farmland, gravel and rubble bed. Slow-flowing, turbid water makes most areas unsuitable as trout water. Riparian vegetation is willows and red gums. This 20 km section of the river immediately upstream from the lake flows through steep/moderate sloping farmland. At Redesdale the river is 7-8 m wide with pools separated by narrow, shallow riffles choked with cumbungi. Substrate is bedrock and sand. Riparian vegetation is red gum, grass, gorse and cumbungi, which restricts access to some areas. At Barford, the river is up to 13 m wide with some deep pools (>100 cm) and with a bedrock substrate. There is good habitat and fish cover at this site. Some brown trout are caught downstream of Kyneton and rainbow trout are taken near Kyneton Falls from self-sustaining populations. The riffles upstream of Lake Eppalock become shallow during summer and would prevent golden perch and Murray cod moving upstream from the lake and colonising this section of the river. Although anglers reported (2002) a few small brown trout and rainbow trout present; a survey by DSE (2004) over a river length of 1.7 km near Kyneton took no trout. Fish caught in order of abundance were tench, redfin (2-27 cm length), goldfish, mountain galaxias, flathead gudgeon and eastern gambusia. There has been some aquatic habitat improvement work to protect populations of southern pygmy perch in the upper Campaspe River and Pipers Creek as part of the Murray-Darling Basin Native Fish Strategy. No longer stocked with trout. The river flows for 45 km, through hills to Barnadown, then through flat farmland to Elmore. There is good riparian vegetation of scattered trees along almost its entire length. There are several good public access points at Axedale and English Bridge. The river is deeply entrenched at Axedale with 6 m high banks. Width varies from 6 to 25 m. Extensive pools 70-180 cm deep are separated by very shallow riffles during the non-irrigation period. Substrate is rubble, gravel and some sand. Excellent instream habitat at Axedale with deep pools, good amounts of snags and overhanging bank vegetation. At English Bridge the river is up to 22 m wide with extensive pools to 165 cm, and also extensive areas of shallow water (30-50 cm) in the riffles and runs during low flow periods. Substrate is gravel and sand. Small boats can be launched from the bank. Contains brown trout to 2 kg (below the wall of Lake Eppalock) occasional rainbow trout, redfin to 900 g, golden perch, goldfish, tench to 1.7 kg, and European carp to 5 kg. Also Australian smelt, blackfish, flathead gudgeon, mountain galaxias and eastern gambusia. Some Murray cod are also present in the deeper pools between Axedale and English Bridge, from past stocking. Occasional Macquarie perch and rainbow trout are reported to occur but this has not been confirmed. The section of river immediately downstream of the spillway of Lake Eppalock carries a self-sustaining population of brown trout. After a trial stocking period (1995-97) with brown trout it was decided to cease stocking trout in this area. Some very large trophy-size brown trout (av.2 kg) can be taken with a variety of fishing methods in this location when water is being released from Eppalock. However access is difficult and best managed by experienced anglers. Anglers report that some brown trout can also be taken downstream as far as English Crossing at Goorong. The river downstream to Elmore was stocked with Murray cod from 1987 to 1991. Stocking of golden perch was halted in 2008 due to water quality issues. Stocking will recommence with improved water conditions. An additional flow of 3,800 ML/year has been committed in 5 reaches of the river downstream of Lake Eppalock under the Environmental Water Reserve program. The weir (not marked on the map) is located just downstream of Elmore. It is surrounded by farmland and has a mud bottom. Boats are permitted. Received a stocking of Murray cod in early 1990s and again in early 2000s. Also contains golden perch and Murray cod from regular stocking in the river upstream. The Weir is considered to be one of the best fishing areas along the Campaspe River with angler reports of catches of golden perch and Murray cod. Contains Murray cod, golden perch to 1.5 kg, redfin to 600 g, goldfish to 600 g, European carp to 5 kg, tench, Australian smelt, flathead gudgeon and eastern gambusia. This 20 km reach of river is affected by irrigation diversions. It is a narrower (10-16 m) section of river flowing through flat farmland with good riparian vegetation of mature red gums. It has a sand-bed with considerable snags, which has resulted in the formation of gutters and holes. The riffles are 30-50 cm deep, with the holes and gutters 70-100 cm and pools up to 140 cm deep at summer flow levels. During low flows much of the sand substrate along the edges is exposed with resulting loss of fish habitat. 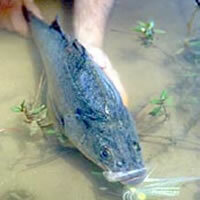 Water depths in summer are inadequate for Murray cod, marginal for golden perch but suitable for smaller-sized fish. Most abundant fish are redfin to 600 g, goldfish to 600 g, flathead gudgeon and European carp to 5 kg. There are also Australian smelt, eastern gambusia and some golden perch. Best fishing opportunities are in Rochester weir. This 45 km section to the Murray River flows close to the main road and is very accessible. It has good riparian vegetation of native trees. It is a shallow river with all sand substrate and varies in width from 14-22 m. During summer it has extensive riffles 20-40 cm deep and shallow pools (60-100 cm deep). Abundant instream snags has resulted in gutters and channels in the streambed, which provide habitat for fish. Water depth increases to 200-260 cm in the pools during high flow periods. The river becomes deeper closer to the Murray River with extensive deep pools upstream of Echuca. Contains redfin to 550 g, European carp to 5 kg, goldfish, tench, occasional brown trout, golden perch to 1.4 kg and very occasional Murray cod. Also Australian smelt, flathead gudgeon, western carp gudgeon, eastern gambusia and the occasional silver perch and trout cod. Native fish are able to move into this section of the river from the Murray River and from stocked areas upstream. Murray cod are stocked regularly but stocking was cancelled in 2008 because of poor water quality. Stocking will recommence when water conditions are suitable. Occasional freshening flows (2008) are provided downstream of Rochester Weir. The extended drought and low flows has resulted in the encroachment of vegetation into the riffles and large sections of the river are now a series of pools separated by narrow, shallow riffles. Much of the lower reaches would probably be not worth fishing until flow increases. A fishing platform, suitable for persons of all abilities, has been constructed at Echuca as part of the Recreational Fishing Grant Program funded by Recreational Fishing Licence fees. A small, narrow stream, flowing through farmland, gravel bottom. Accessible only through private property. Catchment is modified and the river has a low flow with turbid water during summer. Some trout spawning occurs with fish also moving upstream from Upper Coliban Reservoir. Contains brown trout to 700 g with larger spawning fish in May/June, blackfish and redfin to 550 g. Lightly fished, with good catches at times. Suffering the effects of drought and has not been stocked for several years. A short length of water (500 to 1500 m depending on water level of the reservoir) carrying small brown trout and redfin. A 35 km length of river flowing through hilly farmland some distance from the road. The lower reaches between Metcalfe and Sutton Grange Road are very inaccessible. Flow is controlled by releases from Malmsbury Reservoir. Flow for 1-4 months during July to October is adequate but is very low at other times. Riffles in the upper reaches vary between 1 to 2 m in width and 5-50 cm in depth. The pools are up to 8 m in width and up to 130 cm in depth. Substrate is rock, rubble and sand. There is good habitat in the pools but numerous barriers to fish movement are present during low flow. River width increases to 16 m in the middle and lower reaches (Metcalfe to Sutton Grange Road) from natural inflow of ground water. The pools in this section are mostly quite shallow (60-95 cm) during summer and there are extensive shallow riffles (av. depth 20 cm). Substrate is sand. Riparian vegetation is red gum, tea tree and cumbungi. There is also some terrestrial vegetation of wattles and willows, growing in the deeply entrenched channel at Metcalfe. There is some good instream habitat for small-sized fish, closer to Lake Eppalock. Movement of Murray cod and golden perch from Lake Eppalock, into the Coliban River is unlikely because of shallow water in the riffles and a scarcity of deep pools. Contains abundant brown trout to 350 g, small redfin, blackfish, tench, trout galaxias and goldfish. Best fishing areas are below Malmsbury Reservoir wall and at the base of any waterfall or small weir. The river was stocked with trout cod (1990/91 to 1992/93) and Macquarie perch (1988-90). Further stocking has been cancelled because of unsuitable habitat. 3,230 ha. 312,000 ML. Boat ramps, caravan and camping facilities. A large water storage on the Campaspe River which supplies irrigation water via the lower Campaspe River and domestic water for Bendigo, Heathcote and a number of other towns. It is surrounded by forest and open country and has a mud, sand and rock bottom. There is a good balance of deep and shallow water and in spite of the large fluctuations in water level, it is reasonably productive. The lake is popular for water skiing, powerboat racing and fishing. In 2000 a DSE survey found that the lake had good numbers of golden perch, redfin and European carp. Recent catches have included golden perch to 7 kg, (av.1 kg), Murray cod av.1.3 kg, redfin to 2 kg (av.750 g), abundant European carp to 5 kg, tench to 3 kg and the occasional brown trout to 3.5 kg. Other species present are occasional Australian bass, rainbow trout, roach and goldfish. The Murray cod population has not been properly assessed but there are unconfirmed reports of Murray cod to 10 kg. Brown trout are now extremely rare in this water. In the past, trout up to 3 kg were taken near the mouth of Wild Duck Creek in winter and, in those years when there was a good inflow, or during the winter months in the shallows when the lake was full. The lake provides excellent fishing for redfin (December-May best period) with Derrinal and Kimbolton pools in the northern area being popular fishing spots. Good baits are scrubworms and yabbies. Lures and jigs are also very successful in locating schools of redfin. The southern area of the lake and the mouth of the two inflowing rivers are popular areas to catch Murray cod and golden perch to 4 kg. Golden perch can also be taken on lures trolled over the bottom. Lake Eppalock filled rapidly after the abundant rain in 2010. As a result it is anticipated that the stocking of golden perch and Murray cod will be resumed in the near future. Deep domestic water storage on the Coliban River surrounded by forest and farmland. Bank fishing only is permitted, and boating and wading are banned. The margins are relatively bare and have little or no vegetation because of the large and regular fluctuations in water level. Vehicle access is limited and considerable walking is required to reach most areas of the lake. It is a popular angling water containing mostly redfin to 900 g (av.350 g), brown trout to 1.4 kg and roach to 300 g. Has good water levels (2008/09) and anglers were taking redfin and brown trout. It is stocked regularly with brown trout yearlings. A deep storage on the Coliban River surrounded by forest and farmland. It is a domestic water supply and bank fishing only is permitted. It has more shallows than the other two Coliban storages (Lauriston and Upper Coliban Reservoirs) and is probably more productive. Fishes particularly well when the water is rising over newly grassed shallow margins. These conditions have, unfortunately, not occurred since 1999. Contains brown trout (av.1 kg), max. usually 2.8 kg, but fish in excess of 4 kg have been taken, abundant small redfin average 350 g, some to 1.2 kg, tench to 1 kg, goldfish to 700 g and roach. It is a very popular fishery and is heavily fished for redfin and trout. Anglers reported (2008) some trout activity around the dam wall. Low water levels (1%) in 2009. Malmsbury Reservoir filled rapidly after the abundant rain in 2010. As a result it is anticipated that the stocking of brown trout will be resumed in the near future. A very small creek flowing through farmland, gravel bed. Accessible through private property. Contains brown trout to 1.3 kg, small redfin, tench, goldfish and possibly a few rainbow trout. Family Fishing Lake. Toilet. BBQ. Picnic facilities. A spring fed, shallow, weedy lake with grassy banks. Good access to the water. Managed as a Family Fishing Lake and subject to stocking with advanced yearling rainbow trout (see Introduction). A small shallow lake surrounded by farmland. Bank fishing only is permitted. Was stocked unsuccessfully with trout in the 1960s. Contains mainly small redfin to 220 g and an occasional small brown trout. No longer stocked. A deep, domestic water storage on the Coliban River surrounded by farmland. Bank fishing only is permitted. Being the uppermost of the three Coliban storages, it is usually the first drawn down in periods of high demand. This results in fluctuations in water level and bare margins. Stocked annually with brown trout. Also stocked with Macquarie perch fingerlings from 1994-97. Unfortunately the lake was almost totally drained for maintenance in 1999, while the success of this stocking was still being evaluated. Prior to draining, it contained abundant brown trout to 2 kg, abundant redfin to 1.5 kg, numerous Macquarie perch to 700 g, goldfish, occasional blackfish and European carp. Further stocking with Macquarie perch is under consideration. This is one of only three waters where anglers may target and take Macquarie perch. The others are Lake Dartmouth and the Yarra River and its tributaries. Upper Coliban Reservoir filled rapidly after the abundant rain in 2010. 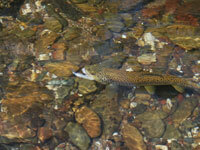 As a result it is anticipated that the stocking of brown trout will be resumed in the near future. There is some brown trout spawning in the Coliban River upstream of the reservoir. European carp and roach were illegally introduced in the 1990's and will move downstream and into the lower storages when the reservoir spills. Main irrigation channel running west from Waranga Reservoir to the Mallee. An irrigation channel running through open land and farmland. Bank fishing is permitted but not from channel structures. Contains redfin to 1 kg, some brown trout to 750 g, goldfish, occasional golden perch and European carp. Water level becomes low during the non-irrigation period.